Quinoa is just plain fun to eat. You either like the nutty texture or you don’t. I happen to be a big fan of it. Cold or hot, quinoa makes a great addition to any meal or as a main stay. This dish is a play on a Tabbouleh recipe, with loads of parsley and a lovely addition: basil oil! The kick of basil and red pepper flakes really make this recipe! Cook quinoa according to directions on package. Typically 1 cup quinoa to 1 cup water plus a bit more. Bring to boil then reduce heat for 15-20 minutes. If water is still remaining but quinoa is cooked, you can drain in a colander or stir on medium heat until remaining water evaporates. Allow quinoa to cool a bit. You can speed this process up by constantly stirring to allow the heat to escape or refrigerate for 30 minutes. The key is to not add remaining ingredients while quinoa is hot. 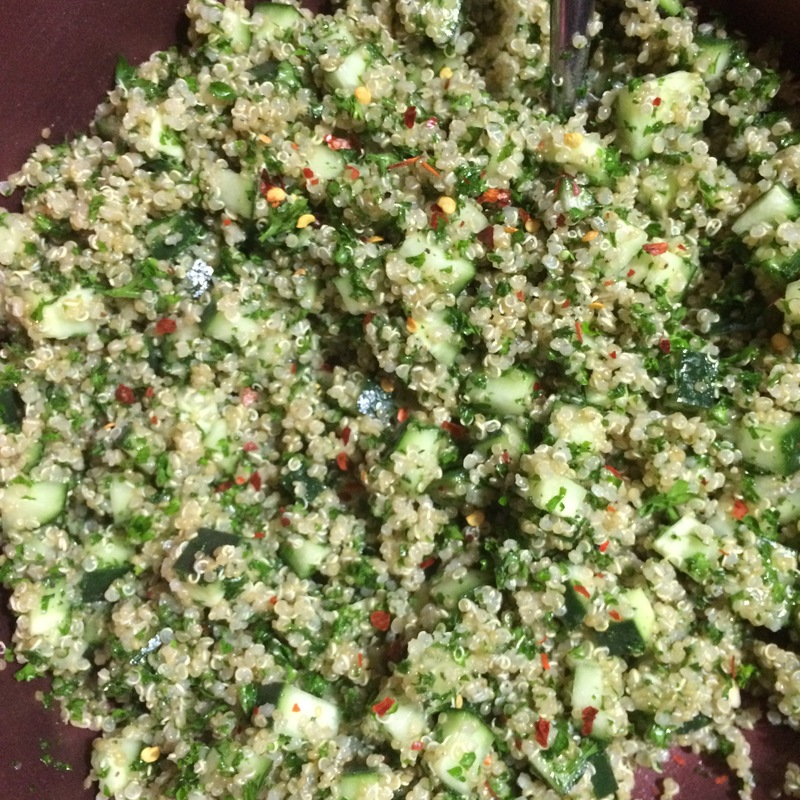 In a large bowl, mix quinoa, cucumber and parsley together. Add lime juice and basil oil. Mix well.